The who, what, where, when, why, and how of the ASC Theatre Camp. 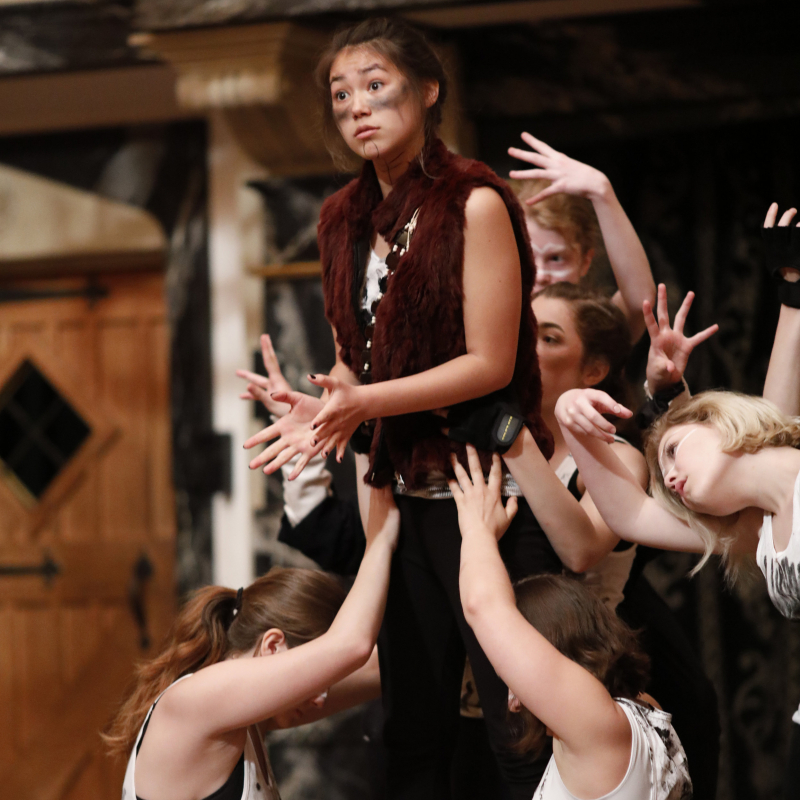 The American Shakespeare Center Theatre Camp (ASCTC) is an immersive, intensive, residential experience for students. 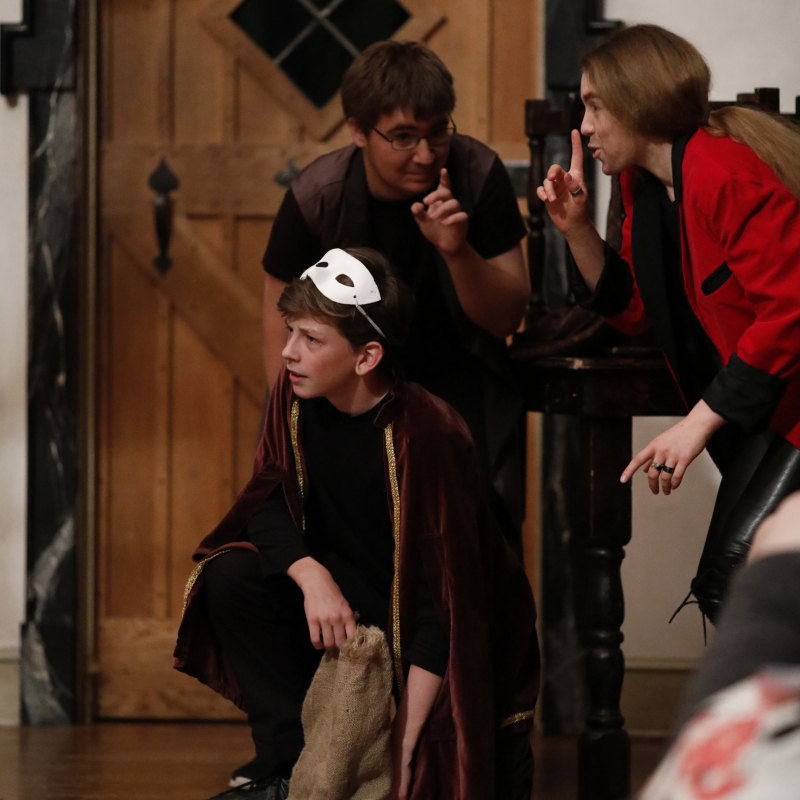 Campers work with each other and with ASC actors, professional directors, and renowned scholars to study the world of Shakespeare’s stagecraft in detail while learning about text, technology, and themselves. 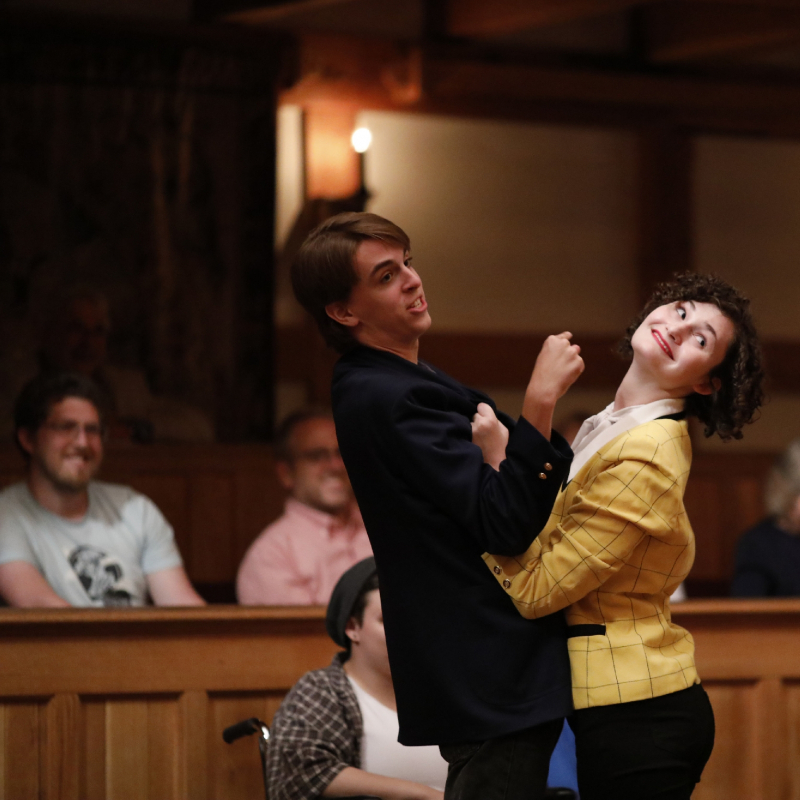 Each ASCTC session culminates with campers strutting and fretting the boards of the Blackfriars Playhouse stage in one-hour versions of early modern plays. This is the only place where I can study Shakespeare in the light I want to and with other students who have the same love. The American Shakespeare Center is in Staunton, Virginia — in the heart of the beautiful Shenandoah Valley. ASCTC likewise lives in downtown Staunton, with campers living in a Mary Baldwin University dormitory. They eat in the dining hall, rehearse in the University’s theatre (among other places), and attend lectures, classes, and workshops across campus. They make frequent trips to the nearby Blackfriars Playhouse (a few blocks from the dorm) to attend ASC performances and rehearse their own shows. Who can go to ASCTC? ASCTC accepts rising 8th graders through rising college freshman, ages 13-19. The age/grade boundaries are a little fuzzy, and we handle applicants who blur those lines on a case by case basis. Generally, the rule of thumb is as follows: we will accept a current 7th-grader who will be 13 as well as a current high school senior who might be 19 by the start of the session. Not sure if you’re eligible? Contact Lia Wallace at lia.wallace@americanshakespearecenter.com to make sure. ASCTC takes place over two three-week sessions every summer, with the Extended Experience Week taking place in the week between sessions. How much does ASCTC cost? Tuition is $3625 a session. Tuition covers everything for the three weeks following a camper’s arrival at orientation — room and board, transportation in and around Staunton, any costs associated with camp activities (field trips as well as tickets to all ASC show performances), camp t-shirts, and professionally edited DVDs and digital downloads of the session’s Final Performance Festival). We have some scholarship opportunities, and financial aid is available for qualifying accepted campers. Find out more about tuition payment options and financial aid in the Tuition & Aid section. Campers live on the Mary Baldwin campus in the University’s newest dormitory building (built in 2002), the PEG Center. Air conditioning, free laundry, and wireless internet are just a couple of the amenities offered. Our Residential & Directing Assistants (RDAs) also live in the dorms in order to provide 24/7 in-house supervision and assistance. The dorm is on the edge of campus bordering downtown Staunton – just two blocks from the Blackfriars Playhouse. The dining hall, rehearsal, and workshop spaces are all on MBU’s walkable campus (steep hills build strong calves). Dorm rooms are double occupancy, but some rooms house up to three campers. Each room is equipped with twin beds and desks. You must provide your own bedding, pillows, sheets, towels, etc. You are welcome to decorate your room with posters or pictures, but must use double sided tape as opposed to thumb tacks. All campers (and residential staff) live in the same building. We assign roommates based on gender identity: campers room with other campers who identify as the same or similar gender. We decide room assignments for campers who identify outside of the gender binary in conversation with the camper, their family, and camp staff. There are four community showers and toilets in the dorm, each serving approximately 10 campers. (Residential staff have en-suite bathrooms.) We have designated female, male, and gender-neutral communal bathrooms, as well as gender-neutral single-person toilets on the lobby level. What are the outdoor exercise facilities available to campers? Mary Baldwin University is located on 54 acres, with large field, varied outdoor spaces along with tennis courts made available to the ASC Theatre Camp. The MBU campus is on a large hill, and we tend to keep campers fairly busy moving from place to place throughout the day; a certain amount of outdoor physical activity is thereby guaranteed. Additionally, depending on interest, RDAs usually organize a morning running group led by one of our counselors. Hunt Dining Hall provides a variety of nutritious options for every meal. Vegetarian, vegan, and gluten-free options are always available (along with the salad bar and cereal station). Picky eaters may not always love the options available on a given day, but eating well when eating in a dining hall is valuable practice for making healthy decisions about food in college. We allow campers to check out for meals (with family or in groups) and explore the many affordable dining options in downtown Staunton, which happens to be crammed with cafes, pizza joints, sandwich shops, and other lunch spots; not to mention our fabulous Farmer’s Market, a block from the Playhouse every Wednesday and Saturday morning. What's the campus security situation at Mary Baldwin University? Like all residential colleges, Mary Baldwin has on-campus security. In addition, our very capable residential staff are with our teen campers 24 hours a day, 7 days a week. The PEG Center features an alarm system that ensures proper access. Counselors perform nightly “lights out” checks, as well as, give morning “wake-up” calls to make certain everyone is safe. Between our hands-on administrative staff, show directors, RDAs, production interns, and master class teachers, the ratio is about 4 campers to every adult supervisor. You do not have to audition in order to apply for the ASC Theatre Camp. Our application process is similar to the Common Application used by most colleges, and is based around a personal essay instead of an audition. However, we do indeed conduct auditions on the first full day of camp in order to cast the campers into one of the session’s three productions. Auditions are a combination of traditional monologue performance and collaborative improvisational techniques which simply require a willingness to play and creative choices in the moment. All administrative staff, show directors, RDAs, and production interns are present for these auditions. Staff sits down to hammer out casting immediately afterwards, while campers take their introductory voice and movement workshop. We usually post cast lists and distribute scripts before dinner that same day, so campers can begin familiarizing themselves with their parts before the first rehearsal. Will I be cast in more than one show? Each ASC Theatre Camp participant is cast in only one of the three shows we have slated for that session. Campers might receive one role or several depending on the demands of the play. The final performance is not the only performance opportunity during camp, however. Campers have multiple opportunities and outlets to showcase their talents. Each cast has a designated space on campus where the majority of their rehearsals will take place, including Deming Hall (MBU’s black box theatre space). In the past we have used rooms in Grafton Library and the ballroom in Hunt as rehearsal spaces, but we are always on the lookout for other options that may be more comfortable, less crowded, and more conducive to creating theatre. In addition to these spaces, each cast will have several opportunities to rehearse in the Blackfriars Playhouse – approximately 8 hours per cast, including the final late-night dress rehearsals. When/how often do we rehearse? Rehearsals take place 6 days a week and are scheduled in 3-4 hour blocks. Most rehearsals are in the morning, between breakfast and lunch. Campers are encouraged to schedule meetings with directors, RDAs, production interns, or camp administrative staff for extra help with line-learning and/or scene/monologue coaching. Every member of our experienced staff considers working with campers on their parts a big highlight of their job at camp – and the camp administrative staff in particular would relish any opportunity to work with students instead of spreadsheets. Seriously. On the final day of camp, we take over the Blackfriars Playhouse for the afternoon in order to perform all three plays one right after the other. We finish the day with a quick strike at the Blackfriars and then a big celebratory picnic with parents and friends on the grounds of Mary Baldwin. Ready to make the plunge? Apply now for the ASCTC 2018 summer sessions. Looking for information about tuition prices, scholarship opportunities, and financial aid applications? Check out the tuition & aid section for answers to all your financial questions. Visit our Checklists page to find a full, printable packing list along with some general guidelines about what to bring (and what not to bring) to camp.